North of the level crossing on Station Road (B1342), about one mile east of the village. Station building Grade II listed and in residential use (holiday accommodation). Base of signal box retained as a relay room. The coal drops and an adjoining stone building are still in place. The village and parish of Belford had a population of about 2,000 when the Newcastle & Berwick Railway opened in 1847. That its station was considered the principal one between Lesbury (for Alnwick) and Tweedmouth (for Berwick) reflects the sparsity of northern Northumberland’s population. The region was afflicted by centuries of unrest, with raids by the Scottish ‘rievers’ on communities in England – and of English on the Scots – until the border became fixed and the English and Scottish crowns united in 1603. Belford gained some importance as it stood on the ‘Great North Road’, and as travellers gained the confidence to journey through this formerly troubled countryside the village became a point where coach-horses were changed and travellers could refresh themselves and rest overnight; the Blue Bell Hotel was a former coaching inn. Belford’s weekly market was established in the 1740s – centuries later than in many villages and towns elsewhere in England – and in 1863 the now ‘iconic’ Bradshaw’s Descriptive Railway Handbook referred to Belford as a ‘snug little market town’. It is commonly thought that the coming of the railways inevitably led to growth of the communities they served, but Jack Simmons in The railway in town and country (1986) shows that it was not always so, and Belford is a case in point. The village declined in population from its 1841 figure, and in 1951 it was only 891. The inconvenient site of the station, a mile from the village, undoubtedly reduced its attractiveness to Belford’s residents. Although it was not the closest station, the coastal village of Bamburgh was officially served by Belford; thus the footnote ‘for Bamburgh’ in railway timetables. From the late nineteenth century tourism gathered momentum and Bamburgh (with its historic role as ancient capital of Northumbria and its splendid, but much restored, castle) brought business to Belford station. 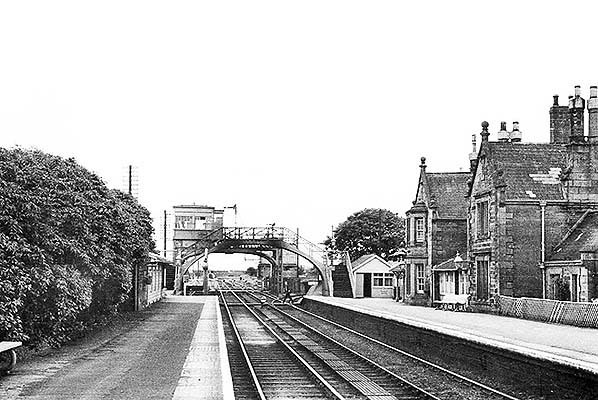 Belford was also recognised as the station for the township of North Sunderland, which included the better-known village of Seahouses and was from 1898 until 1950 to be served by a branch line from Chathill. 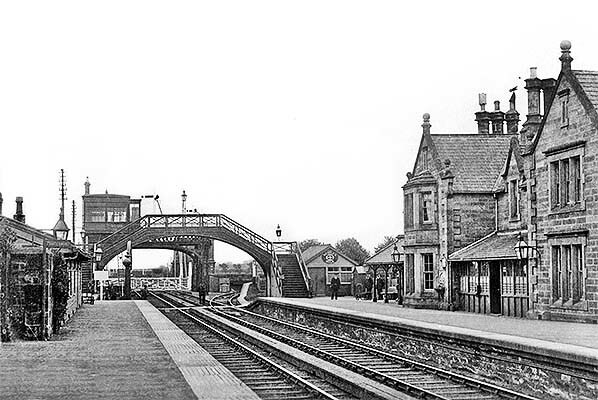 Wooler and the communities of Glendale looked to Belford as their station until 1887 when the NER belatedly opened the railway between Alnwick, Wooler and Coldstream. In its capacity as a regional railhead, Belford was provided with a particularly large and dignified station building by the Newcastle & Berwick Railway, a company which built generous facilities even at its humblest stations. The N&B provided a large warehouse for goods traffic, exceeded in size only by the company’s facility at Trafalgar (Newcastle). Tweedmouth (£8,629) and Morpeth (£2,632) were given by far the most expensive station buildings, but Belford followed them with a structure costing £1,671 in the contract, a little more expensive than Warkworth (£1,649). Belford station building is, happily, still standing on the down (south-west) side of the railway and enjoys Grade II listed status. In common with those at other N&B stations it was designed by Benjamin Green and it is constructed of sandstone ashlar with a Welsh slate roof in the Gothic ‘Jacobethan’ style, a popular idiom for country houses at the time it was built. The main structure has two storeys and is built on an H-plan. On the platform elevation the south cross-wing has a two-storey canted bay window, whilst the north-west cross-wing has mullioned windows with dripstones above them on both floors. A verandah (enclosed with timber and glass in North Eastern Railway days) beneath a lean-to roof, is clasped between the two wings, and a pair of gabled ‘half-dormer’ windows is above on the upper storey. Single-storey wings extend along the platform at both ends, the north-west one with an asymmetrical ridged roof. In the south-eastern single-storey wing the roof is carried forward to form a verandah, supported by four square columns with serrated brackets, and a canted bay is at its south-eastern elevation. The forecourt (south-western) elevation is highly commended by Fawcett in Biddle (2003) for the ‘massing of the frontage and Green’s typical arcading’. The arcading is in the south-western cross-wing, its three Gothic arches flanked by angle buttresses, with a mullioned window above. In the central section is a bay window with an off-set gabled ‘half-dormer’ and an arched doorway to the north-west. The north-western cross-wing has a lengthy single-storey projection, formerly with a tall chimneystack. The roofs are pitched and display the N&B’s customary raised gables and kneelers, and ball finials are found on the upper-storey gables and kneelers. Tall, diagonally-set chimneystacks of two and three conjoined shafts enliven the roofline. The up platform had the standard style of N&B waiting shed, stone-built with a pent roof sloping down towards the platform edge. In common with other N&B stations at Belford the waiting shed was enclosed with timber and glass by the North Eastern Railway and provided with a fireplace to provide passengers with greater comfort. Behind the up platform was the commodious two-road goods warehouse. 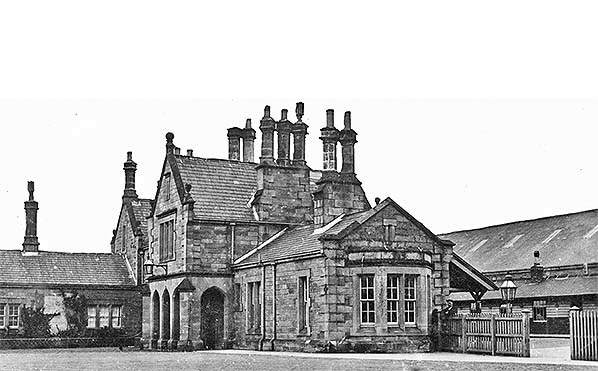 This elegant structure complemented the station house, being built of sandstone beneath a ridged Welsh slate roof, with its gables flanked by kneelers and surmounted by ball finials. Belford’s coal depot was situated to the north-west of the passenger station, served by two sidings training from the down line. The goods facilities were behind the up platform, with the large two-road goods warehouse originally having one siding passing through, and a loop between it and the platform. A short siding was found between the down platform and the level crossing. By the end of the century two further sidings had been installed west of the coal depot and a second siding entered the goods warehouse from the south-east. The North Eastern Railway installed a standard curved-profile footbridge south-east of the platform buildings. This graceful design was made up of cast iron parts which were erected on site. The castings were lettered and numbered to facilitate assembly. Regrettably the original standard drawing for these bridges is undated, but they appeared at many NER stations in the late nineteenth century. A timber lock-up shed was also added in NER days between the station building and the south-eastern end of the platform. A signal box was built by the NER between 1873 and October 1877 north-west of the level crossing on the down side. 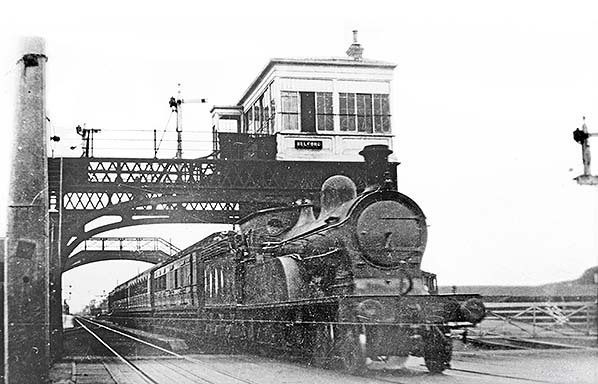 This was abolished c1901 when an N3-style bridge cabin replaced it above the up main line track and located immediately north-west of the crossing; a 52-lever Stevens frame was installed. South-east of the level crossing on the down side was a water tank elevated on a sturdy stone base. A water crane stood at the south-eastern ramp of the up platform. Despite its importance the station remained in an isolated position. Belford Hall and its park prevented the eastward growth of the village towards the station, if there had been any intention for such development. A brick-and-tile works, accompanied by clay pits, stood several hundred yards west of the station, but there was no associated workers’ housing, and by 1898 the works had closed. Six railway cottages were built adjacent to the station, east of the level crossing, and three more to the west before the end of the nineteenth century. In 1904 the Railway Clearing House Handbook of stations indicates that Belford handled the full normal range of goods and possessed a one-ton capacity yard crane; Cragmill Siding is also noted as being supervised by Belford. (Further details of this facility will be found on the Crag Mill station page). NER 1913 statistics record that 2,239 tons of roadstone and 761 wagons of livestock were handled. A livestock auction mart was built west of the station, adjacent to the coal depot. Easington whinstone quarry several hundred yards north-east of the station had been connected to the goods sidings at Belford by the 1920s. Belford station served an estimated 1,760 people in 1911, and the NER recorded a total of 12,461 tickets issued. By standards of the day this was a small figure, and it was exceeded by its ECML neighbours of Acklington (13,696), Chathill (15,335), Warkworth (17,682) and Alnmouth (49,041). The service shown in the winter 1912-13 North Eastern Railway timetable is generous for a village of modest size, and several of the calls are by semi-fast trains. However the departures are at distinctly irregular intervals. The 10.26am down departure is shown to run as far as Beal; this train waited at Beal for about half-an-hour, moving off the main line to enable the northbound 10.48am departure from Belford to call on its way to Edinburgh, before completing its journey to Berwick. In 1923 the North Eastern Railway ceased to exist and its assets became part of the new London & North Eastern Railway. Belford station remained little-altered in LNER hands, although the company installed its own running-in nameboards which had metal letters pegged to a wooden board. The station remained oil-lit. Since the end of World War I the NER had worked to increase the capacity of the ECML by installing ‘independent’ lines, effectively long loops which could be occupied by slow-moving freight trains enabling faster passenger trains to pass them. The first was installed in 1918, a Down Independent between Beal and Goswick, and the last to be constructed were Up and Down Independents between Belford and Crag Mill, one mile north, which opened in 1925. The 1931 LNER Sectional Appendices noted that the ‘Independents’ could be used, when necessary, for passenger train working, but the 1947 edition refers to them as ‘Passenger Independents’. The 1960 (BR) edition called them ‘Up and Down Slow Lines’, but by 1969 they were ‘Up and Down Passenger Loops’. They remain in use in 2015. By the mid 1930s the responsibilities of the stationmaster at Belford were extended to include supervision of Lucker, the neighbouring station on the route towards Newcastle. In the years after World War I road transport began to offer a serious challenge to the dominance of rail, and the villagers of Belford would appreciate the convenience of buses passing through the village rather than face the mile-long trek to and from their railway station. In summer 1931 United buses offered a two-hourly daily service to Newcastle, Alnwick, Berwick and Edinburgh – their ‘interval’ service contrasting with the irregular pattern of train departures - and Rutherfords offered several more each day between Alnwick and Berwick. Although Belford retained something of its service frequency, by this time many of the wayside stations between Newcastle and Berwick had a minimal service, and some had no Sunday calls. Belford was spared the ‘carnage’ on 15 September 1958 when the winter timetable was introduced. Although the station apparently remained unmodernised by British Railways, save for the repainting of the nameboards in BR(NE) tangerine and the wooden and metal surfaces in ‘Oriental Blue’, the elevated signal box was closed on 25 February 1962 to be replaced with a sleek structure close to the south-east ramp of the down platform. Similar boxes were provided on the ECML by the North Eastern Region at Tweedmouth and at Tollerton (between York and Thirsk). Neil Mackay in Addyman (Ed) 2011 remarks that the design of the boxes ‘followed contemporary architectural practice with a glazed control tower atop one end of the relay room; their wide, flat roof and sloped windows (both to counter glare) gave them a pleasing and distinctive appearance’. A BR(NE) vitreous enamel nameplate was fitted, but the opportunity was not taken to provide the station with similar signage. 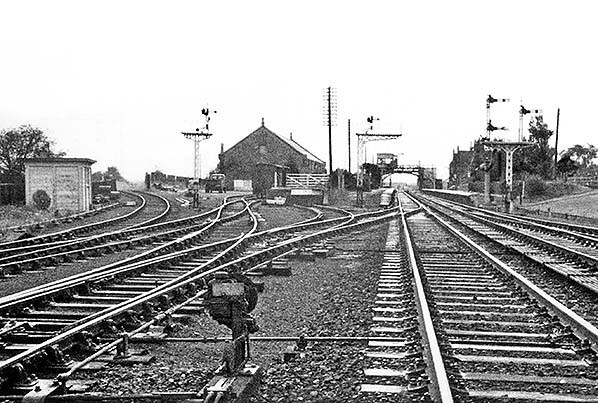 Belford station was a late 1960s closure for which Dr Beeching cannot be held responsible. The Reshaping of British Railways (‘Beeching Report’) of March 1963 was remarkably kind to the Northumbrian ECML stations. The appendix map No.3 (with its crude division of station annual receipts into three bands – £0 to £5,000 / £5,000 to £25,000 / £25,000 and over – and its equally inept cartography) indicated that between Newcastle and Berwick every station apart from Morpeth and Alnmouth (and Alnwick, on its branch) fell into the lowest revenue band; Cramlington, Heaton and Manors were not shown on the map, being omitted from a ‘congested’ area. Despite the light usage of almost every station, only Pegswood was recommended for closure; this station had already survived a TUCC closure enquiry in 1958 and the enquiry into the’ Beeching’ proposal for its closure was deferred until 1966. Tweedmouth was named in the report, but as a station already under consideration for closure. Goods traffic ceased to be handled at Belford station on 7 June 1965. A further review of the financial viability of passenger stations and services between Newcastle and Berwick, and on the Alnwick branch, took place with a traffic census on the weeks ending 10 July and 16 October 1965 to represent summer and winter use. At Belford station the July census found 10 passengers joining and 11 alighting on Monday-Friday while 9 joined and 8 alighted in October; Saturday figures showed 23 joining and 24 alighting in summer, but only 8 joining and 4 alighting in winter. No trains had called on Sunday since September 1964.Travel was found to be almost entirely to or from the south. Interviews in March 1966 identified only four regular passengers who used Belford station (being defined as those known to use the train services on three or more days a week), two of whom travelled to Newcastle and the other two to Alnwick, though it was noted that one scholar returned to Belford by road. The outcome of the review was the publication on 3 March 1966 of a proposal to close Pegswood, Widdrington, Belford and Beal stations, as well as Alnwick on its branch from the ECML at Alnmouth. A focus of the complaints about the closure proposal for Belford station was on Chathill, six miles south, which was not being considered for closure. Objectors to the closure of Belford complained of increased travel times that the use of buses would incur and that there was no connecting bus to Chathill for the early morning train to Newcastle. One objector claimed to be perplexed by the ‘preferential immunity’ of Chathill (population 50) over Belford (population 891), while another argued that Belford was a far better railhead given the relative inaccessibility of Chathill by road; and yet another argued that ‘bus connections to Chathill are almost useless’. A local hotelier thought that Belford station was ‘100% more convenient for Belford [village], Bamburgh and Seahouses’. In the opinion of a Bamburgh man, ‘if you have to close a station I would suggest that Chathill be the one as it is almost inaccessible from the coast and … it is impossible to get to Chathill for the majority of trains’. A further objection, that Chathill was ill-equipped for its ‘regional’ role, brought the repost from British Rail that ‘the lighting is adequate for the number of passengers using the station’. In 1966 Chathill (like Belford) was dimly lit by a few antique oil lanterns – which seems incredible from a 21st century ‘health and safety’-obsessed perspective. The official justification for the proposal to close Belford rather than Chathill was that, despite the objectors’ impression of Chathill’s inferior case for survival, it was typically used by 30 passengers per day, twice Belford’s figure of 14. The 1967 ticket bookings provide some support, with Chathill issuing 2,373 and Belford 1,346. On 6 August 1966 the TUCC report was sent to the Minister of Transport, Barbara Castle. On 2 January 1967 BR’s North Eastern Region was abolished and absorbed into the Eastern Region, which was to have no implications for the closure process. Eventually, on 28 September 1967 Mrs Castle announced her decision to close three of the five stations proposed for closure: Alnwick, Beal and Belford. In its coverage of the news under the headline ‘Axe falls on more North stations’ Newcastle Evening Chronicle reported the BR (Eastern Region) assurance that the views of the Northern Economic Planning Council had been taken on board and that the Minister noted the TUCC’s view that there would be some degree of hardship, particularly for regular commuters to Newcastle, and for users of Belford, Alnwick, Widdrington and Pegswood stations. The Assistant Secretary, Ministry of Transport, gave the assurance that ‘she has also concluded that there are reasonable alternative bus services available for the limited number of users of Belford and Beal stations’. Belford, Beal and Alnwick stations closed to passengers on 29 January 1968. Within four years at Belford the platform faces and the footbridge had been removed and the waiting shed on the up platform was demolished. It is not known when it took place, but the large goods warehouse was also dismantled. This structure could surely have found another use, rather than simply being a source of good building stone. However the station building was left intact, received Grade II listing, and survives as a superb example of the fine Newcastle & Berwick Railway architecture. It is in use as holiday accommodation. The 1962-built North Eastern Region signal box outlasted the station. 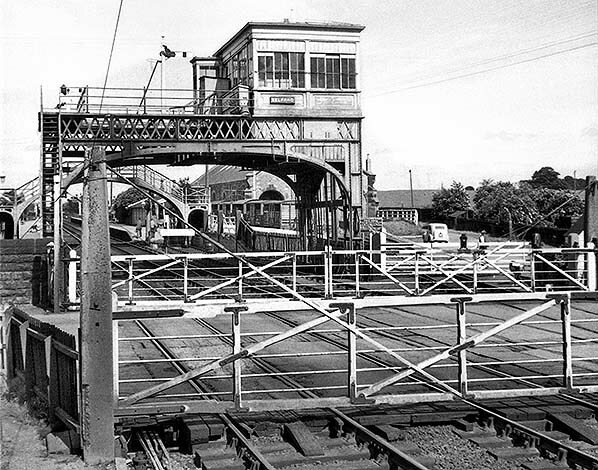 In September 1966 the electrically-operated crossing gates which it controlled were replaced with boom gates, and the box continued in operation until 8 July 1990. From this date the crossing was supervised by CCTV from Tweedmouth, and the ‘control tower’ was dismantled leaving the base to continue its use as a relay room. The rail connection from Belford goods yard to Easington quarry remained in use after the station closed to goods traffic in 1965. The quarry has since closed – at an unknown date - but the railway sidings remain mothballed in the hope that one day it may reopen. Whereas the additional ‘independent’ loops elsewhere on the ECML in Northumberland have been removed, both the up and down loops remain between Belford and Crag Mill. There is also a siding which trails from the down line towards the remains of the coal drops, north-west of the former station building. Belford station is still isolated from the village it serves, more conspicuously so since the A1 eastern bypass was constructed in the 1980s between the village and the station, although the B1342 still connects them. An industrial site including grain silos occupies the land west of the station where there were formerly clay pits and a brick-and-tile factory. The auction mart which was immediately west of the station has closed and been dismantled. Belford remains a compact village, but a large residential estate has been built at its southern end, and the population has risen to about 1,250, adding weight to longstanding requests for the station to reopen. Although closed for almost half-a-century, every weekday morning and early evening an empty stock passenger train arrives from the south at Belford station. This practice began in 1995 as a curious side-effect of rail privatisation, when Chathill became the improbable northern terminus of local services from Newcastle; this is the northern frontier of the franchise currently held by Northern Rail Ltd. The summer 2015 timetable shows a Monday-Friday 06.46 arrival from Newcastle at Chathill, departing for Newcastle at 07.00, and an 18.49 arrival from MetroCentre leaving for Hexham at 19.10 – with differences in the Saturday timings. As intimated, when the two down services have discharged any passengers at Chathill they continue six miles as empty stock to Belford where they switch to the up track and return to Chathill for their advertised service to begin. It would have a negligible effect on timings if these trains could serve passengers at Belford, and the calls for the reopening of Belford station which began as soon as it had closed have been strengthened by the 20 years of their useless and frustrating ‘phantom’ passenger trains. Although it might appear outside their geographical heartland, SENRUG (South East Northumberland Rail User Group) has added to its campaign to have passenger trains reinstated on the Blyth & Tyne route (Newcastle-Bedlington-Morpeth/Ashington) the cause of reopening Belford and Beal stations. The group would like to see an extension of local trains (most of which travel no further north than Morpeth) to Berwick, providing a Northumberland Coast service, for commuters, tourism and leisure. Because the old station building at Belford is in private ownership the plan is to construct a platform on the up loop opposite the old station buildings. The old, disconnected, line into Easington (or Belford) Quarry that leaves at this point is to remain mothballed as there are still occasional calls for it to be used for grain traffic. As with Chathill at present, Belford would presumably be unstaffed so a passenger shelter would be required with no facility for staff to issue tickets. In an article on 5 March 2015 the Berwick Advertiser noted that in 2013 an unsuccessful bid to fund the provision of the station platform at Belford had been made to the Department for Transport’s New Stations Fund. However Northumberland County Council has earmarked £100,000 in its Local Transport Plan for 2015/16 to develop the plan to have the station reopened. The scheme is progressing through the Network Rail Management process (GRIP) to secure the necessary approvals. Plans for Belford station are currently at GRIP 4 stage, which is where the preferred option is identified. The detailed design is completed at GRIP 5, for which the NCC funding is intended. Councillor Scott Dickinson, the council’s business chairman, said ‘this is a long-standing ambition of the council and would provide a range of economic benefits to both the tourism and business economy in the north of the county’. One of the arguments in favour of the reopening of Belford station is that it will take some traffic from the currently single-carriageway A1 road; however the Berwick Advertiser article notes that recently £290 million was spent on upgrading a short stretch of the A1 – against which the £100,000 is modest. The isolated setting of Belford station can be clearly seen. The large goods warehouse is the most prominent building, with its associated sidings to the north-east of the passenger station. The main station building is on the down (south-west) platform, and there is a waiting shed on the up platform. The coal depot, with the coal drops and nearby weigh office (W.M. =weighing machine) are clearly indicated. Railway cottages are shown indistinctly north of the road to the east of the level crossing. The ‘Engine House' ’e was possibly associated with the water tank on the opposite side of the tracks; a ‘Pump House’ is shown on the 1925 map adjacent to the water tank. The station building is shown with greater clarity and detail on this map in comparison with the earlier edition. The goods warehouse now has two sidings entering from the south-east. The signal box is shown on its first site; it would be closed c1901 and a new box placed above the tracks. A footbridge now connects the two platforms. The railway cottages east of the crossing are shown more clearly and appear to have been added to, and a short terrace of three cottages has been constructed south of the (now un-named) coal depot. The signal box shown on the 1898 map has been replaced with the bridge cabin shown above the up track at the south-eastern end of the up platform. The sidings north-east of the goods shed have been installed in connection with the short branch to Easington (later known as Belford) whinstone quarry. Directly west of the coal depot a livestock auction mart has been built. 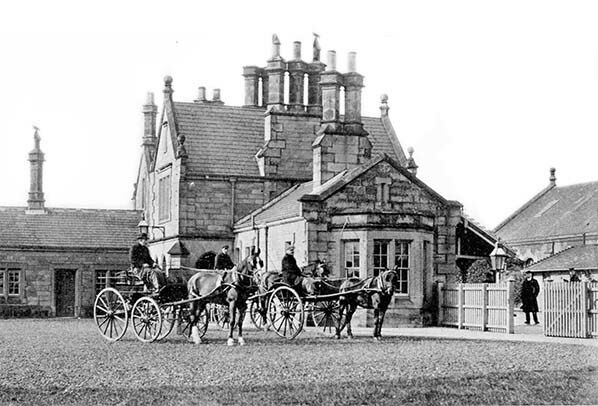 Belford station, looking north across the forecourt c1906 as horse-drawn carts await business. The station building displays the fine architecture produced for the Newcastle & Berwick Railway by Benjamin Green. It is in the Gothic ‘Jacobethan’ style, built of sandstone ashlar, and complemented by the design of the goods warehouse (extreme right) and the waiting shed on the up platform. Belford station circa 1920s, looking north-west from the level crossing. The gantry-mounted signal box (‘bridge cabin’) was constructed c1901, and beyond it is the NER footbridge. The locomotive, a D20 4-4-0, is heading what is probably an up stopping train from Berwick to Newcastle. The loco number cannot be identified, but it is Worsdell-designed and constructed c1906, and it possibly remained in service until the early days of British Railways. An undated view of Belford station, looking north across the forecourt. The dignity of the Newcastle & Berwick Railway station building of 1847 can be appreciated, including the elegant Gothic portico, the canted bay window on the nearside, and the forest of lofty chimneystacks. On the right, beyond the NER casement lantern, the waiting shed can be seen on the up platform, its timber front being a later NER addition to the original open-fronted N&B structure. The roof of the goods warehouse dominates the background. A general view of the station in 1958, looking south-east from the up platform. The elegant Newcastle & Berwick Railway building of 1847 is on the down platform: a ‘Jacobethan’ design by Benjamin Green in sandstone ashlar, with the distinctive canted bay windows, verandah clasped between the cross-wings, decorative ball finials on the gables and kneelers, and tall chimneystacks. The much more modest waiting shed on the up platform is of the same vintage. Beyond are the standard, arched NER footbridge and the signal box carried on a gantry above the up track, also an NER structure. A water crane is at the ramp of the up platform and a water tank is beyond the level crossing on the down side of the line. Remarkably little has changed since the c1910 view from a similar point. Looking north over the level crossing towards Belford station on 3 July 1959. The crossing gates are particularly wide as they stretch across the main line and sidings. The bridge cabin is beyond the crossing, and it partly obscures a rake of cattle wagons and the goods warehouse. On the far side of the footbridge the waiting shelter can be seen on the up platform. Belford’s goods and passenger facilities looking south-east on 30 October 1959. The siding on the far left gives access to the short mineral branch from Easington (Belford) whinstone quarry. The massive goods warehouse dominates the scene; the earliest OS map on this page indicates that two roads entered it from the northern side, but only one opening remains at this time. To the right the station building, footbridge and bridge cabin can be seen.